Members of the Richmond Heights City Council on Tuesday delayed a decision on allowing Airbnbs in the city at least until the next council meeting. Planning and zoning members last week decided to let it drop without taking a vote, Mayor Jim Thomson said. The city council could have done the same, but since the city newsletter due out soon says it’s under consideration and that residents should tell their council representative their thoughts, they delayed a decision until the next council meeting, on March 5. Several council members said they knew the opinion of only a few residents on the matter. At that meeting they could let it die or schedule a public hearing as a next step. The Richmond Heights Planning and Zoning Commission Thursday night discussed allowing residents to use their homes to operate an Airbnb short-term rental business, and according to a resident they were unfavorable to the idea. Update: apologies for this now being the second update. A Richmond Heights resident reported that the commission voted against Airbnbs 8-0, which was reported here. Then city manager, Amy Hamilton said no vote was taken — the plan was to just listen at the Feb. 15 meeting, a public hearing, and vote at the next. Richmond Heights City Manager Amy Hamilton reviewed at the city council meeting on Monday what the updated joint fire command looks like now with Rock Hill and Clayton having dropped out. Rock Hill opted out for financial reasons: it would have cost the city about $100,000 to buy in to the program. Clayton’s fire chief retired in October 2017 so that city’s command situation is in flux. According to Hamilton, Richmond Heights is the only one of that city, Brentwood and Maplewood that would come out in the positive in the plan. She said Richmond Heights would save about $34,000 in the collaboration but Brentwood and Maplewood would pay more for fire services costs. Incumbents Reginald Finney (District 2) and Dan Sebben (District 4), as of Tuesday, were the only candidates for Richmond Heights City Council to have filed to run for office in the April municipal elections. A city employee said eight other potential candidates have taken out petitions but haven’t turned them back in. The terms of Matt Casey (District 1) and Edward Notter (District 3) also will expire in April 2018. Richmond Heights officials Monday night took a step, though not unanimously, toward making a decision — possibly yea or nay — to allow short term rentals (STRs). Going around the table, council members expressed considerations allowing STRs — such as online services like Airbnb, such as limiting the number of allowed STRs on a block, limiting street parking for renters, polling the neighbors to see if it’s wanted on the block, whether the city would require a sales tax, and how violations would be handled. The council members agreed, with three dissenting, to send the idea to planning and zoning for its recommendation. The P&Z meeting, likely be held in February, would also be a public hearing. The city council would take it up after that, in a meeting which would also include a public hearing. 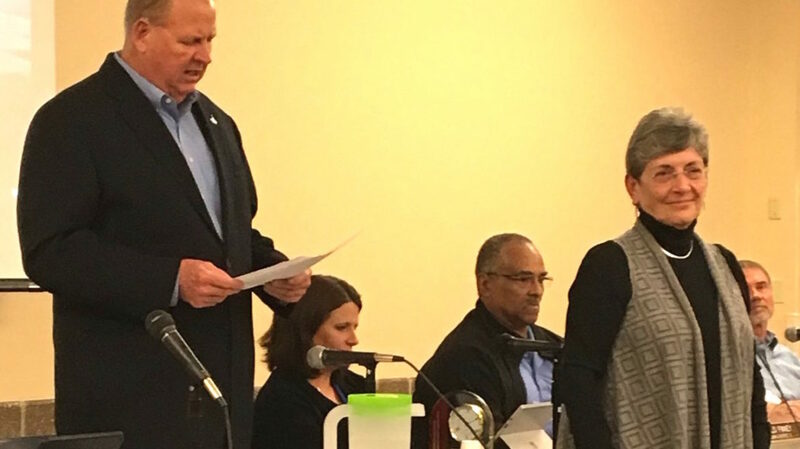 At its meeting on Monday at The Heights, the Richmond Heights City Council recognized the Mid County Chamber 2017 business person and citizen of the year. Mayor Thomson congratulates Christy Byrd of Clarity Street Realty, who was honored by Mid County Chamber as the Richmond Heights Business Person of the Year. Byrd previously worked for Citizens National Bank in Maplewood. Mayor Thomson congratulates Joellen Gamp McDonald, who was honored by the Mid County Chamber as RH Citizen of the Year. Gamp McDonald is the author of Richmond Heights: 1868-1940. Election Packets are available for pickup at City Hall. Candidates must file their nomination petitions (signatures of 25 registered qualified voters) and acceptance of nomination forms at Richmond Heights City Hall between November 21, 2017 and January 12, 2018. If you have questions, please contact Deputy City Clerk Pat Villmer, pvillmer@richmondheights.org or at 314-645-4595. The city of Richmond Heights pointed out in its newsletter email this week that nightly rentals are ‘NOT’ permitted in residentially zoned areas — “pretty much everywhere except hotels!” — though some resident Airbnb operators show up on the Airbnb site. According to city assistant manager Pam Hylton the city individually contacted the owners of the Airbnbs operating in Richmond Heights to ensure they understand that nightly rentals in residentially zoned areas are not permitted. It’s also not permitted in Brentwood. Maplewood officials voted to allow short term vacation rentals in 2016. 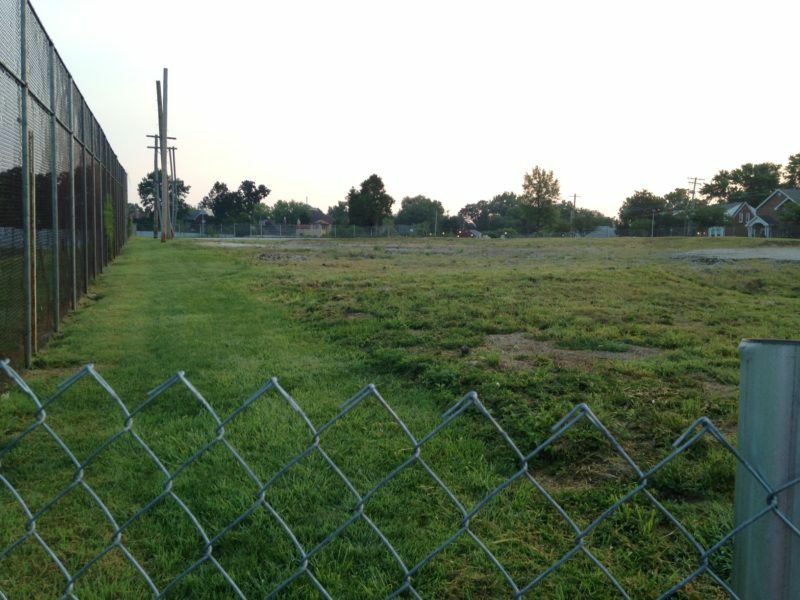 At the Richmond Heights City Council meeting planned for Monday, a Red Robin restaurant is seeking a permit for 8115 Dale Avenue, according to the council agenda. The address is on the northeast corner of Dale Avenue and Hanley Road — the location for The Crossing at Richmond Heights; now under construction. The completed development is to include a five-story hotel, restaurants and retail shops. The Red Robin is the first business named. Richmond Heights officials are also scheduled to vote (second reading) on the East Central Fire Command, combining the command structure for the fire departments of Richmond Heights, Rock Hill, Brentwood, Maplewood and Clayton. The City of Richmond Heights reported on Tuesday it has received the Certificate of Achievement for Excellence in Financial Reporting by the Government Finance Officers Association for the 27th consecutive year. The recognition was for the city’s report for the financial year ended June 30, 2016. The certificate of achievement is the highest form of recognition in the area of governmental accounting and financial reporting, the city says. The city’s Comprehensive Annual Financial Report (CAFR) met high standards, including a “spirit of full disclosure” to clearly communicate its financial story and motivate people to read the CAFR, according to the association. The City of Richmond Heights Finance Department is led by Director Sara J. Fox. Richmond Heights officials on Monday approved blighting, and a plan for tax relief for the developer for Boland Place, a multi-use building on the corner of Dale and Boland — making way for demolition to continue for the project. The bill passed the council 6-2. Council members Ed Notter and Joan Provaznik cast the no votes. Telling the council why he needed the tax plan, developer Joseph Cyr said the gap between what he had valued the property at and the county’s assessment was $2.5 million, affecting the value of the property, what a bank will loan, and the rent he would need to charge; and ultimately the project’s success. He said he is committed to paying his fair share of taxes. 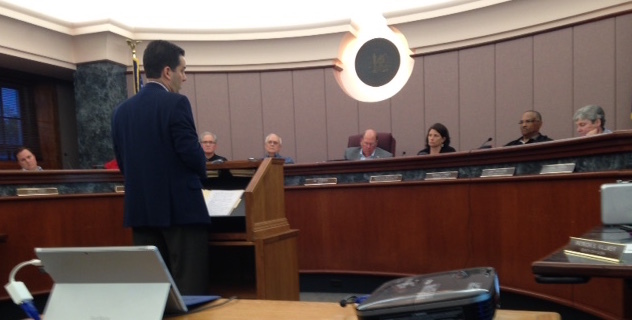 In a hearing at the Richmond Heights City Council meeting on Monday, the council heard details of a proposed tax relief plan for the developer of Boland Place, a mixed-use development at Dale Avenue and Boland Place. Richmond Heights City Manager and the developer, Joseph Cyr, called the tax relief a PILOT (payment in lieu of taxes). Under the proposed plan, which the city council has yet to vote on, the annual property taxes on the completed project would be capped at $297,000 for ten years. It’s estimated that the plan would save Cyr $100,000 over the 10 years, paying about 72 percent of what the tax would be otherwise. If, in an an assessment, the taxes go under the $279,000 cap, the lower tax would be owed. 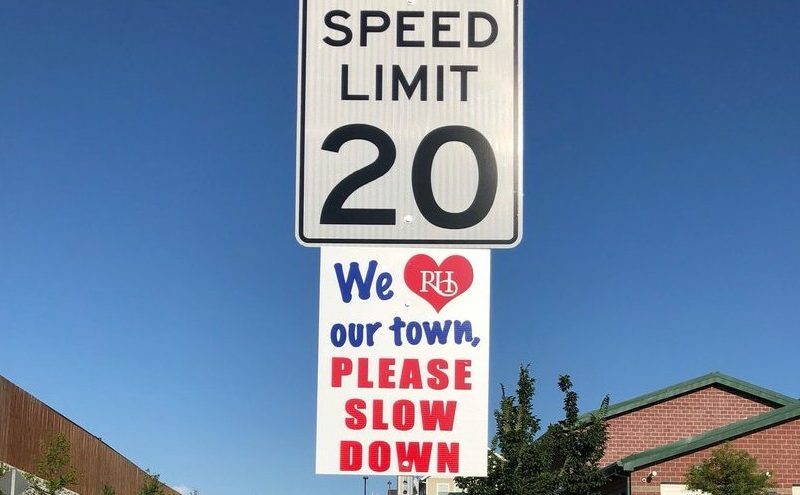 Richmond Heights officials Monday night approved Pace Construction Company to resurface seven city streets this summer. More streets will be sealed, to extend their life. Bellevue, Ethel, Hoover, Mabel, Dale and El Moro avenues, and Commodore Drive will all be resurfaced this spring, according to the city on Twitter. In addition to resurfacing those streets, Pace will also apply an thin sealant to the asphalt on other streets that are in good condition, which a Pace representative at the meeting said would extend their life for an additional four to seven years. After the sealant is applied a substance he described as “kitty litter” will be applied for about a day, then swept off.